It is that time of the post season, where the final two teams are resting up, coaches and management are going over their rosters and finding ways to squeeze every drop of potential out of their team and hockey writers and blogs are littering the world wide web with their Conn Smythe Trophy predictions and front-runners. Well here is the Sin Bin's nomination, Dustin Brown, and why he should be on the top of everyone's Conn Smythe list. This is not my Kings bias coming out by the way. Brown has played the most dominant hockey of his career since the puck dropped for the opening round of these playoffs against the Vancouver Canucks. Brown has piled up seven goals and 16 points, while grabbing a plus 13 rating in 14 games. Browns game does not fade off after the offensive aspect of his game. Brown has unloaded 67 hits, is averaging just under 21 minutes of ice time per game and is a contributing factor to the suffocating defense and fore-check that comes with the Los Angeles Kings' style of play. Brown has done it all for the Kings, he has scored timely goals, including three game winning goals, he has been a thorn in the side of every opponent the Kings have faced and has carried his team into the Stanley Cup Finals. Sure there are other players like, Jonathan Quick, and the New Jersey Devils' Zach Parise and Ilya Kovalchuk in the race for the title of playoffs MVP, but when you look at who has had the most influential part on his team and which team might not be here if that player is not on the ice, Brown wins. 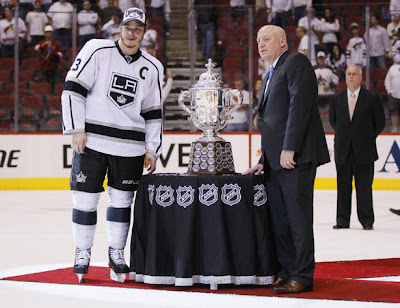 At the moment Brown has both the Kings' locker room and the Kings' fan base believing that Lord Stanley will be spending the summer getting tan on the beaches of Southern California, largely in part because of the play he has been putting out on the ice. The final round starts on Wednesday, watch for Brown to strengthen his hold on the Conn Smythe will more dominating play.